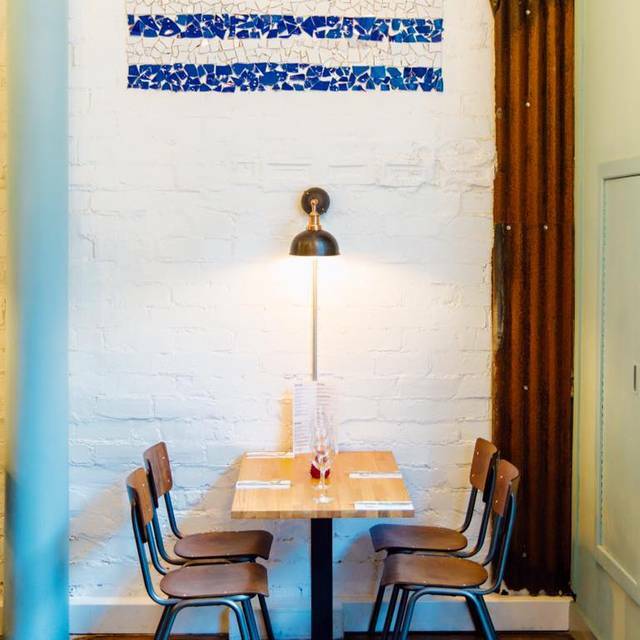 Halloumi es un restaurante griego ubicado en el centro de Glasgow que ofrece gastronomía clásica de taberna griega con un toque moderno. Halloumi se especializa en ofrecer a sus comensales excelentes cortes de res a la parrilla, así como quesos, y ensaladas frescas. Términos y condiciones: Maximum of 8 diners. Includes Tax, excludes service. £15.95 per person for 3 dishes on the market menu. conditions: 1- Please note that a 10% service charge will be added to all parties of 6 or more. Términos y condiciones: Maximum of 8 diners. Includes VAT, excludes service. Excellent meal and friendly efficient staff. Good food, good value. Nice ambience. Quite modern. Went for dinner with my mum before going to the theatre and had an enjoyable meal with quick, efficient and friendly service. First thing we were greeted with is we need the table back by 8.30, our table was booked for 7.30. Noise levels were unbearable. Food all came at once, so got cold very quickly, the octopus was tough. We had dined here several time before for lunch, which was very enjoyable. We will not return in the evening, a carry out would have been more relaxing. I really do want to like this place restaurant but.... The food is very over priced and just not that great. Watermelon and halloumi salad was slices of chargrilled halloumi laid between slices of ice cold watermelon which was clearly straight out of the fridge. So the cheese was cold before it even got to the table. Not very nice. Scallops are a tiny portion for the price. Tables are very small so if there are 2 of you and you order the number of dishes that they recommend, there just isn’t room to put everything. The last 20 minutes was taken up by the waiter reminding us that we had to leave soon despite lots of tables around us being empty. The whole experience is not worth the money. Unfortunately, our table was in direct line of the door to the restaurant meaning that whenever the door was opened, a cold air blew in. Some customers even held the door open if there were several of them waiting to be seated. This happened frequently and when we mentioned this to our waiter, we were informed that this complaint had been made before from previous customers at our table. How disappointing that this issue hadn’t been addressed. Crates of dirty dishes were carried right by our table then downstairs. Such a shame as the food and service were great and our experience at a different table would have been a very different one. Great food and friendly service when it was available but took a while to get a drink. I also hate being given a 90-minute slot; no time to relax over a glass of wine, especially after waiting to be served. Prices are decidedly high too. 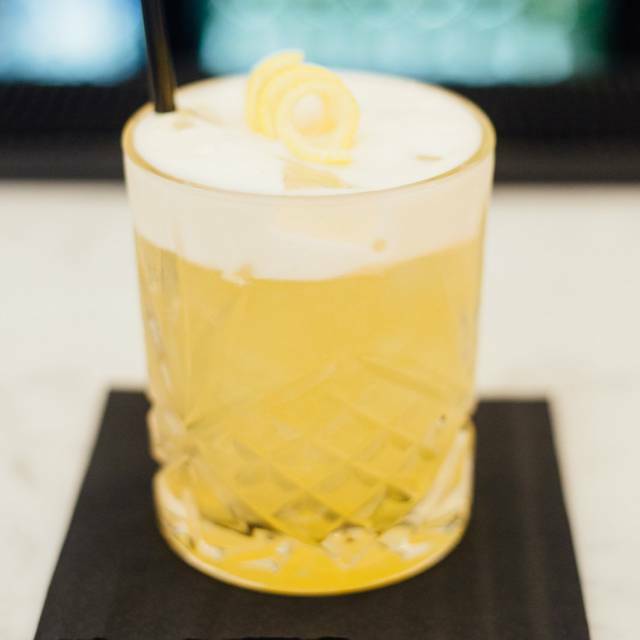 Overall, feels like this place is a victim of its own success as it all felt too frantic and I would not choose it again for a catch up with friends. Love the food here and the Express lunch menu was ideal. Not a friendly welcome unfortunately - ‘you’ve got the table for an hour and a half’ instead of ‘I hope you enjoy your meal’ No quality check. Lots of carrying on between staff at the pass some of which was physical just didn’t create a great impression. Had a lovely lunch including staff singing happy birthday whilst bringing a cake over. Highly recommend. Excellent service,, friendly staff, brilliant food. I would recommend but we were a little early (5 mins) for our table and we were told to stand at the bar. A couple who came in later than us were taken to a table before us and when we spoke to the waitress she told us that she couldn't work the booking system to change us, however, we could perch on the end of someone else's table..! . When finally say at our table about 15 mini after arrival, we ordered food and drinks which were fab. After about an hour and 15 mins our server told us we would have to vacate the table because their next guests were in. I know it's a quick turn around for tables on a Saturday but I just thought it was plain rude. Lovely food, decent drink prices and a really lovely atmosphere! 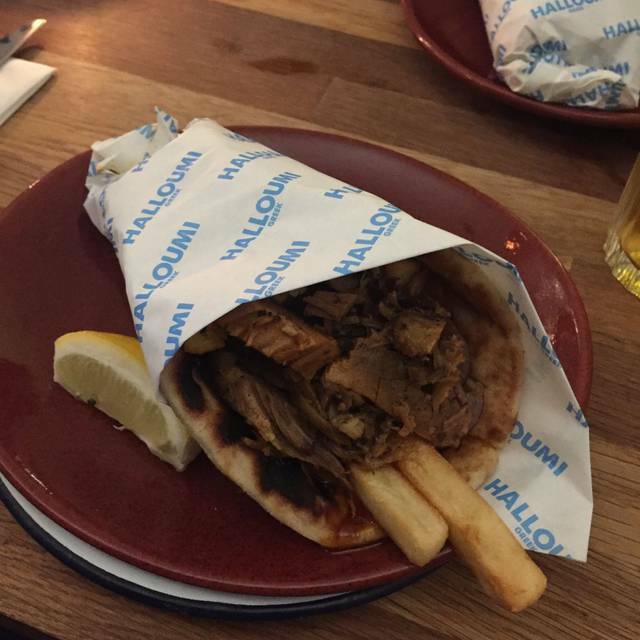 The food and service at Halloumi are both great! The food is fresh and very tasty. I like the tapas style portions! The only reason I haven't given the value for money option 5 stars is because it would be nice if the express lunch menu was available at the weekends. Having said that I wouldn't let it put me off going again. Food was amazing, service was great, can’t wait to go back! Delicious food. Great service. Great value. Highly recommend the gyros. Fabulous food & great service. Absolutely loved it! 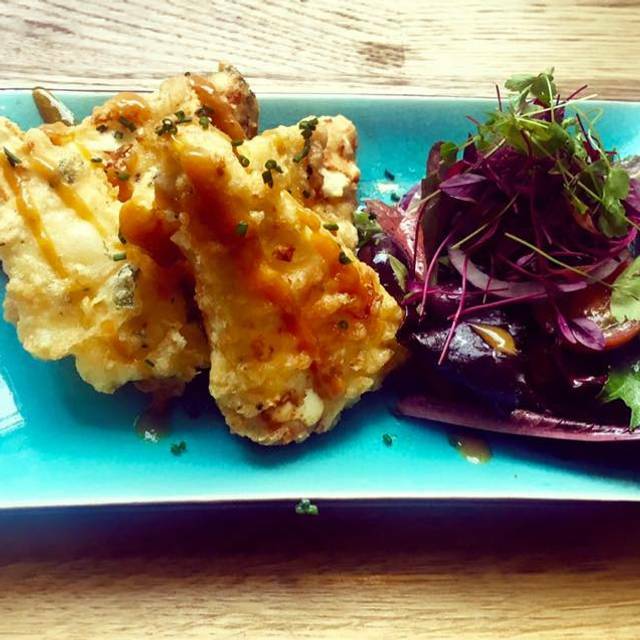 Halloumi is a restaurant that's doing everything right. If you're a student like myself, it's a bit on the pricey side, but you get what you pay for in excellent food from a diverse menu, served in a very timely manner by friendly and helpful staff. The restaurant itself has a tasteful interior design with a relaxing ambience set by the comfortably dimmed lighting. The music could have been more fitting, but besides that it really was the perfect atmosphere for a relaxing evening meal. 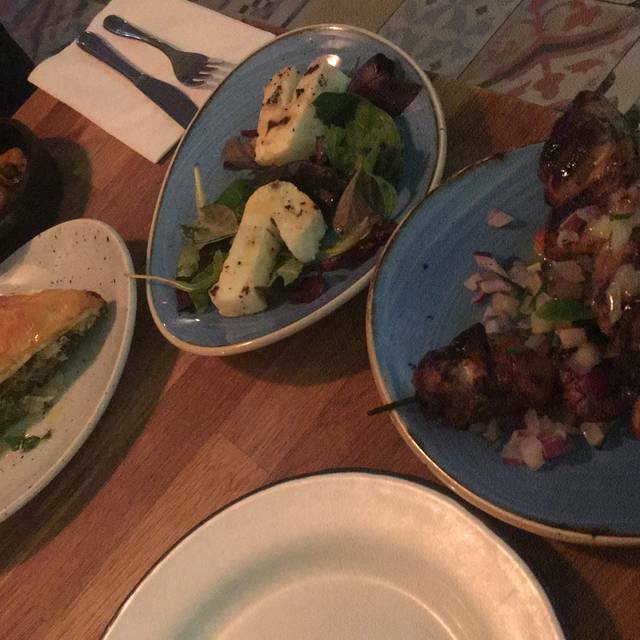 The hardest part of the whole experience was picking from the enticing range of mezze dishes. 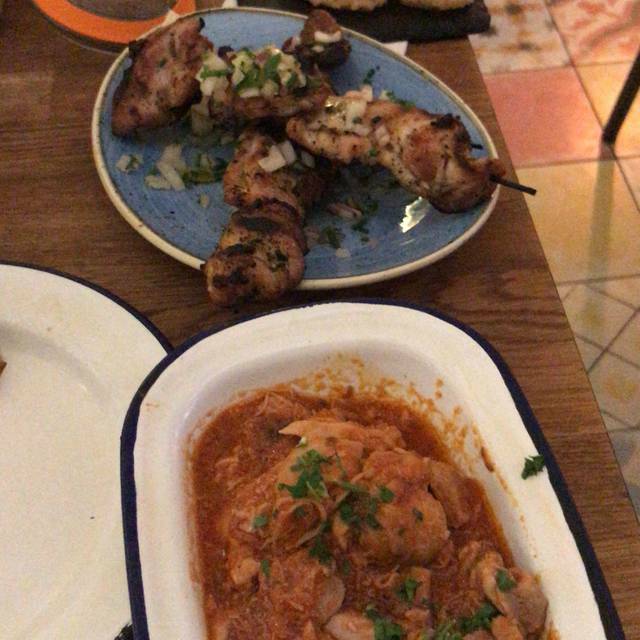 Everything I had was delicious, and with there still being so much left to try that had caught my interest, I'll be sure to make a return to Halloumi. Lovely fresh food. Relaxed atmosphere. Great staff. A family favourite! We visited on Mother’s Day and they had a dedicated menu for the occasion. We had 6 tapas between the two of us and all were delicious. The service was great, they even gave my mum a handful of flowers as we were leaving. Thanks for the review, see you guys again soon! Thank you for the review! We really appreciate your feedback and hope to see you soon! Food and service was outstanding! Staff made us feel so welcome. The food was out of this world, portion sizes are absolutely spot on, not too much and not too little, absolutely perfect!! Thanks for reviewing us! We look forward to your return! Food was delicious and well-presented. Excellent variety in the menu. Portion size was generous but not overwhelming. Service was first-class, staff were friendly, knowledgeable, courteous and efficient. Prices were reasonable for the quality of food. Thanks for the great review! We are so glad you enjoyed it all, see you again! Delicious food. Was quite busy so took a while to take our order then food came before our drinks. But it was all delicious, really tasty stuff! Glad we impressed! Thank you for the review and see you again for more! Absolutely delicious authentic food, can't wait to go back! Only criticism is very noisy restaurant and service quite abrupt but didn't affect our experience. I only wish we'd ordered more dishes! Thanks for the review! We are a busy restaurant and can get a bit noisy and energetic but I am sorry you found service abrupt, will pass that on for training. Hopefully see you again soon! We had table reserved at 1.30, nothing in the booking to say it had to be returned by 3 but we were told on arrival. Drinks took 25 mins to arrive. Food lovely and quick service from that point of view. Would go back. Thank you for the review, we have taken on board your comment and will work on that! Went expecting to have set lunch but did not realise that was not available on a Saturday. Menu recommends 3 items each so that was what we ordered. Food was nice but there was far too much of it for us! We would have appreciated the waiting staff perhaps advising to start with 2 each and ordering more if required. Food served quickly but everything came at once so got cold very quickly. My friend and I found it difficult to have a conversation as if was very noisy. Thank you for the review, I am glad you enjoyed your food! The guidelines which we go by is to order three per person because in our experience most people find that an ideal amount. I am sorry you found it too much, the last thing anyone wants is food going to waste! 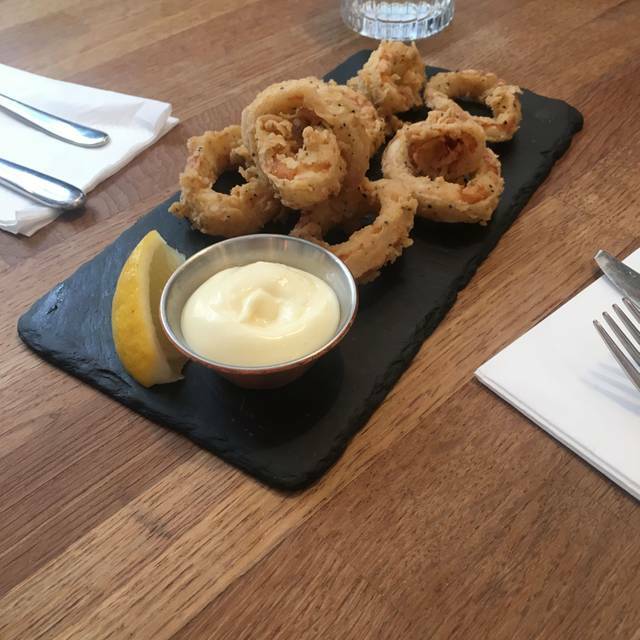 Hopefully you'll be back to dine with us again soon! The music was far too loud. We were inundated with the dishes. They didn’t come in an organised fashion and the table was too small for all the dishes which didn’t make the experience enjoyable. It was very clear that it was more important to turn the table around in 1 hour 30 minutes rather than customer satisfaction. There were numerous draughts and overall it was cold. This place is so amazing and such a gem in Glasgow! The restaurant is beautifully and simpally decorated and the food is light and delicious. Plates are very easy to share but you might not want to! Good food, good service but the background music was far too loud. It's a restaurant not a disco. 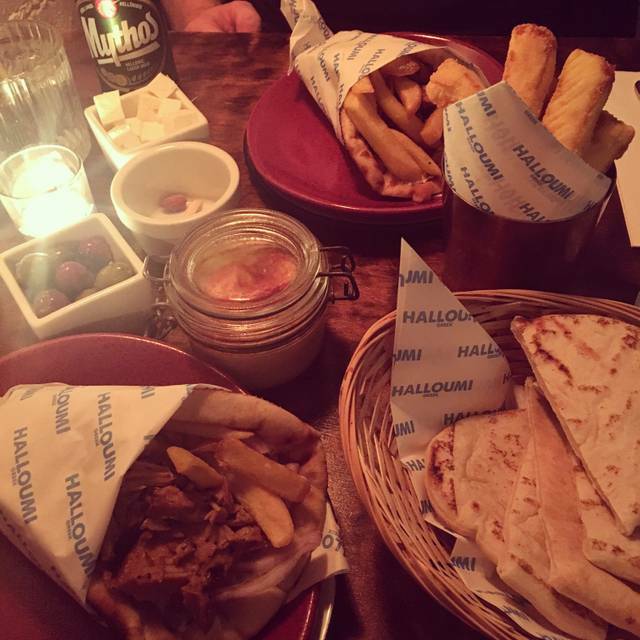 Halloumi was just ok, in my opinion. 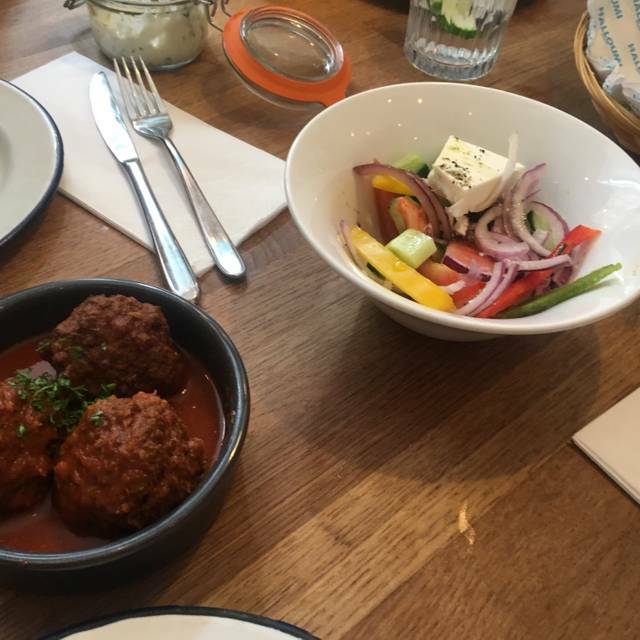 Friends have raved about it so I was looking forward to it but the food is pretty average and there are much better greek restaurants around. A lot of the ingredients and food were things you can buy in a supermarket or make yourself so it was distinctly underwhelming. Having now been to both the city centre and Southside restaurant, I won't be returning to either. I understand why others might like it but not for me!